Best critter control on the market. It's amazing how fast they disassemble and remove one. These just took the soft parts and left the carapace virtually intact. I have seen some take one apart and totally take it away in about 20 minutes a few years ago. Went back to take a pic and there was nothing but a wet spot on the wood left. Maybe there is a greater need to carry food home, when they are in stationary mode and have workers minding broods and eggs - and contrary when in nomadic period. The Army Ants are carnivores and do not eat plants - that would be the Leaf-cutter Ants. 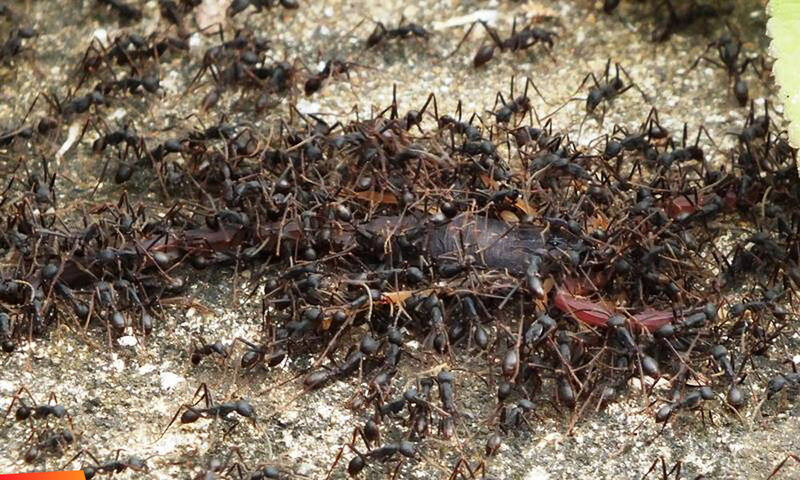 Army ants are nomadic and will swarm your house for a brief moment - cleaning it of bees, scorpions and cockroaches etc. Just keep out of their way and remove your pets. They will move through your house quickly. Wee-wee ants are leaf-cutter ants - different family and very different life style. I hate it when they swarm our house, and eat my plants overnight, or accidently go over my foot while I am trying to get myself or the dog out of their way. Bullet ants don't occur in Belize and are MUCH bigger. The week long swellings those guys give me is painful. While we do not have Bullet Ants, then there some, which locally are called so. Big heavy ant with a seriously painful bite.